No, I mean it. Amazingly. Wholesome. BANANA BREAD MUFFINS. 5 Ingredients. It’s not officially 2017 yet, but as soon as Christmas was done, my brain immediately went into the healthy, energized, refresh and reset zone that always comes with a new year. We’ve got a new baby coming, we’ve got some blog changes in the works, and we’ve got a healthy body (or two) (or three!) to get back in business with lots of new, really good, nutritious, I-will-actually-make-it practical food. Gosh, I get so excited about that combination. Probably good that I have a little blog space to nerd out with that for a hot second. And speaking of having a hot second. NUTRITIOUS: You know that time post-holiday where your body is happy and full on cookies… and also begging to be fed with real food outside the main categories of sugar, frosting, and hot cocoa? Hi. I am you and you are me. 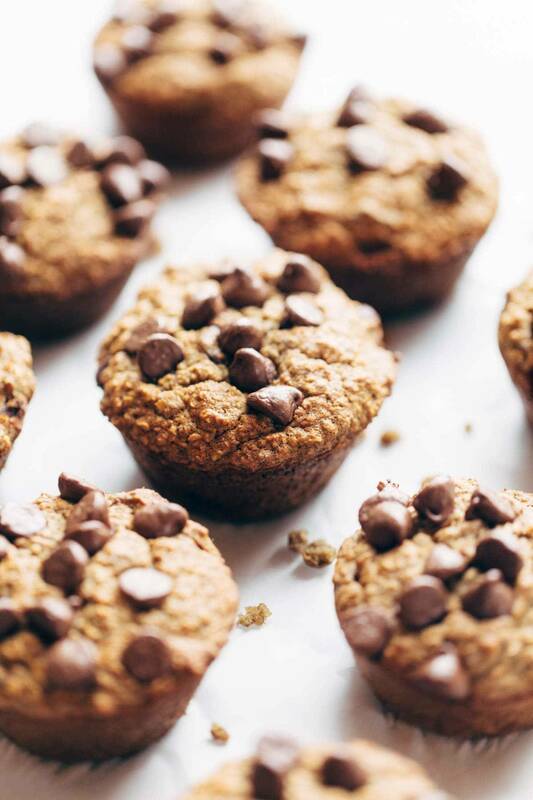 These banana bread muffins are those real food things because they happen to be amazingly wholesome – shout out to oats / bananas / eggs / dates for keeping our bellies full and our bodies glowing. EASY: Is it just me or is that sleepy post-holiday nap addiction still dominating your vibe? My favorite activity of all time since December 25th has become NAPPING. Which is why this = 5 INGREDIENTS. You could memorize this the first time you make it. NOT A SALAD: I don’t know, it feels kind of soon to bust out allllll the healthy eating stops. Don’t you think we should eat comfort food and stay in our slippers and jammies for a few more days? Yeah, me too. I’ll be right over. 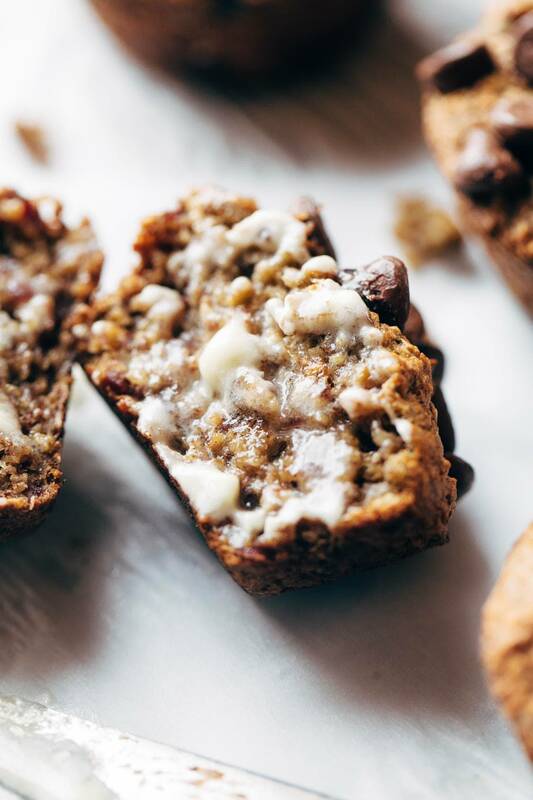 These banana bread muffins are ideal for that confusing time between Christmas and New Year’s Eve where you are very seriously thinking about the fresh-start-new-you mindset but you are still very much embracing the fact that the holidays ARE NOT OVER YET. You can, in fact, have the best of both worlds right here. Banana Bread Muffins FTW. When it comes to toppings or add-ins, there is no pressure to use chocolate chips. Admittedly, that sort of cancels out the No Refined Sugar thing. But admittedly, it IS very delicious. These little muffs have NO major fat source in them, which is super awesome and I was definitely skeptical of whether or not they could actually pull it off and TASTE GOOD, but I really do love them. They sort of remind me of a soft, yummy bran muffin, which a) I love, and b) I love to slather with butter. Okay, okay, if you’re kind of hesitating about the butter on top, no worries – these are great as-is, pinkie promise. Also, a healthier fat alternative might be found in that jar of coconut oil or the super heavenly nut butter that’s been hiding out in your pantry. 😱❤️ It was just a suggestion. 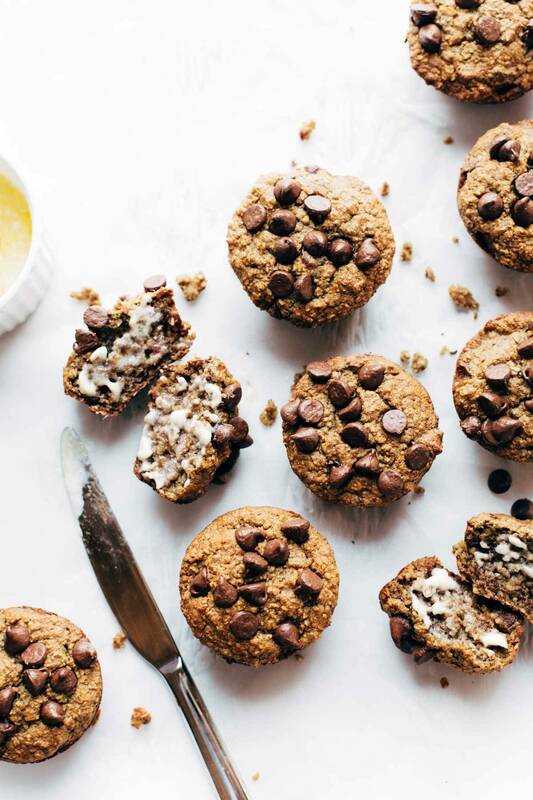 Banana Bread Muffins – made with just 5 wholesome ingredients! no refined sugar, naturally gluten free, and SO yummy! Pour batter into muffin tin (you should have enough for 10-12 standard size muffins). Top with chocolate chips if you want. Bake for 15-20 minutes. Store in the fridge for up to 3 days. We used Dole whole pitted dates which are very soft, similar to medjool dates. Medjool dates also work in this recipe. If you need to soften the dates a bit, just soak in some warm water before putting the blender. This is especially helpful if you have a less-than-awesome blender. Happy, healthy, wholesome mid-holiday week to all of you lovers! I love making muffins with oats! And I’m sure these are perfect for an on-the-go morning, too! Yum these look delicious! Definitely know what you mean about a healthy start post-Christmas and these sound just perfect! 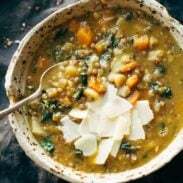 I am right there with you on the healthy/cozy foods–these look amazing! I think the butter is a great idea since we need fat to be healthy (especially developing babies!) Breast milk is super high in cholesterol for that reason! Ok, I trust you when you say they are delicious. Needing more on-the-go breakfast options that are not croissants. Also, healthy things that are not cardboard. New Year’s Day brunch? Yes, yes, it’s all happening. When it comes to recipes that use dates as substitution for added sugar, could I use prunes instead? I never seem to remember to buy dates, but have a half bag of prunes in my fridge! Thank you! I already commented but I just made these. I was too impatient to wait until New Year’s. These were as easy to make as a smoothie. They popped out of the pan with ease. And you were right, super tasty. Not too dense. Definitely not cardboard. My only suggestion is that if you have a cheap blender like I do, opt for the food processor. Old “Hamilton Beach” bessie was not having it. Silly question, but do the bananas actually need to be brown? I know that’s the usual, but the recipe doesn’t say so, and I only have 1 brown banana at home, so I wonder if I could do it with fresh-ish bananas? thanks! Hi Karen, I just made these muffins, and only had one really ripe banana too, so I had to use two just barely ripe ones as well. The muffins still turned out well, I think the only difference is that they would be sweeter with riper bananas. Wow can’t wait to try this recipe. Oh my, my mouth is watering at the thought of these!! I’m definitely going to be trying these out!! Wow that looks amazing!!! I think I’ll try this. These look delicious. I have a ton of frozen banana’s in my freezer. Looking forward to seeing your healthy recipes in January. Made these yesterday, Lindsey. Love you 5 ingredient dishes and make the chili one regularly. These muffins were a hit and so quick and easy! My husband is my sous chef (aka dishwasher) and he appreciated the one bowl (food processor) to clean. What I can use instead dates? We’ve never tried anything other than dates, but I’d think most any dried fruit could work. Made these last night and they are exactly what I have been missing in my life!! Great protein snack with all natural sugar and they taste fantastic! My husband loved them too! Thanks for this quick and easy recipe 🙂 Will definitely be making these more than once. It is one of the recipes are very tasty! I love this recipe one. By the way, thanks for the recipe. Will definitely do them again very soon! And a big Thank you Lindsay! Gotta love a recipe that’s fast, easy and the husband thinks it’s a “Tasty Muffin!!”. These are delicious! Hello! Do you mean 350 centigrate degrees or another unit? Could you please clarify it? Just made these muffins! It was very easy to make and it tastes delicious & healthy! Looking forward to your January recipes! Should work fine! I’d guess about a cup. These are delicious and so easy! My husband asked me to add walnuts, so added 3/4 cup. But I’m sure it would be great without them. Thanks for another great recipe! Made a batch yesterday in mini muffin pa. Unbelievable – no sugar? Really good, whole family enjoyed them. Thanks!